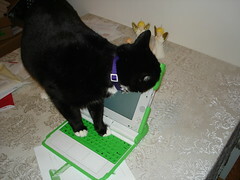 Yesterday I upgraded to a newer build (653) on the OLPC so I can get Internet access on it from the classtoom. WPA encription was not on the original version. It works great from home- I'm actually posting this on it via Opera at home. I'm crossing my fingers, hoping my kids will be blogging from it as well. I've had the laptop in class this past week, and I've found very little time to let the kids really spend enough time exploring its potential. I've had to show them how to do things I know they could figure out on their own if they had enough time - and how fun is that? Making videos is of course way fun, and gets everybody too goofy to allow it to go on for very long... and there's so much more to explore. The kids need time. How to share equitably, ands still give every child meaningful time. It reminds me of not so many years ago when I had one computer in my classroom, and was going through the same thing. I think I'll come up with a schedule, like 30 minutes per week per child.... If anybody has ideas or experiences to share on getting this little marvel into the hands of as many kids as possible, please leave a note here - thanks. Mark, I will have to try that new build. I know that I can go to that wiki to find out how. I am unable to get online in so many places. It will be impossible to get online at school because we have a protected network and NO ONE can get online with an outside machine (Novell). I am finding that when I show it to people they look at it for a bit, say it is cool. Try something, get bored because of the slowness and quit. There is one student who maybe has slight asbergers syndrome or something and is my helper after school. I have challenged him to use the XO and see what he can do. I wish he could collaborate with others. The XO is really built for that and cannot be used to its best without it, but I don't think that is possible. Since your classroom has other computers maybe this one should be used to help a student feel really special whose learning style fits the constructionist method that is required to learn learning.